Free to download, play, and share! Legs is a modern-day Scenario for 4 to 6 Investigators which can usually be run in a single gaming session. The Investigators should already know one-another. Feel free to use the pre-generated Characters included, or have Players create their own characters. Given the nature of this Scenario, experienced Players may find it enjoyable to create themselves as Characters but this is in no way required. Keepers should feel free to adapt the location or other details of the Scenario as desired. The audio handouts, for you to download and use in your own games. 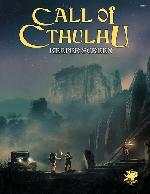 A dark, survival horror scenario for Call of Cthulhu 7th Edition, set in the Pacific Theatre during World War II. Includes 8 pregenerated characters, special-purpose insanity cards and weapon cards, maps, and other player handouts. Designed to run in 4-5 hours for 3 to 6 players. Noticing that there are a lot of adventures written by you. How many total have your written? Just by some of the podcasts I listened to, it sounds like you just spit some of these adventures out within a matter of days whereas some people would take weeks and months to do. What about posting some more of your works here in the books section? Cheers and many, many THANKS!!! I would also like to know these things as asked above.You guys do great work, love this site! Thanks Unknown, and Jonathon. There will be more coming over the upcoming months. The delays are dealt with and out of the way, and I have some (I hope) interesting things getting ready to start rolling out.